The Ohio lawmaker announced her decision as Pelosi announced she would reinstate a subcommittee on elections, naming Fudge the chair. WASHINGTON — The only potential Democratic challenger to publicly consider challenging Rep. Nancy Pelosi, D-Calif., for speaker of the House on Tuesday threw her weight instead behind the California congresswoman. 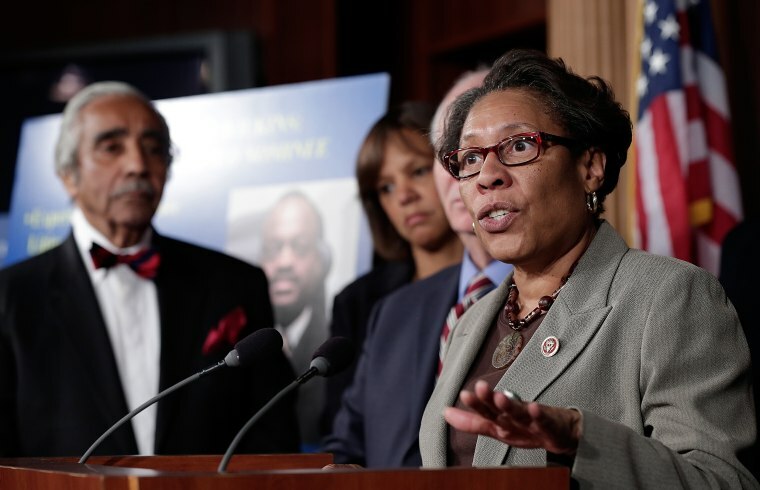 As Rep. Marcia Fudge, D-Ohio announced her decision as Pelosi announced she would reinstate a subcommittee on elections, naming Fudge chair of that panel. "My consideration (to challenge Pelosi) was due in large part to the lack of sustained efforts that ensure diversity, equity and inclusion at all levels of the House. Further, despite the great success we experienced on November 6, voter protection and voter integrity are still at risk,” Fudge said in a statement. “I am now confident that we will move forward together and that the 117th Congress will be a Congress of which we can all be proud. I now join my colleagues in support of the leadership team of Pelosi, Hoyer and Clyburn," she added. Fudge and Pelosi met last week, with Fudge saying after that meeting that she would take some time to determine if she wanted to challenge Pelosi. Sixteen Democrats signed a letter that was released Monday saying they would not vote for Pelosi as speaker. Fudge did not sign that letter. No other candidate has come forward to challenge Pelosi. The sixteen Democrats still pose a numeric challenge for Pelosi, who can only afford to lose the support of about 15 Democrats while retaining hopes of winning the speakership. Opponents are holding on to hope a new challenger steps up. But in another boon to Pelosi, former President Barack Obama said in an interview on Tuesday that Pelosi will be considered among "the most effective legislative leaders that this country’s ever seen." "Her skill, tenacity, toughness, vision is remarkable. Her stamina, her ability to see around corners, her ability to stand her ground and do hard things," he said in an interview in a podcast "The Axe Files," hosted by his former campaign manager David Axelrod. "And to suffer unpopularity to get the right thing done, I think, stands up against any person that I’ve observed or worked directly with in Washington during my lifetime." The House Administration Subcommittee on Elections has oversight of the country’s voting laws and the country’s election agencies, including the Federal Election Commission. Pelosi said Republicans eliminated the subcommittee in 2013. “Chairwoman Fudge will play a critical role in our Democratic Majority’s efforts to ensure access to the ballot box for all Americans,” Pelosi said in a statement on the new committee and Fudge’s new role. Pelosi spent much of Thursday and Friday of last week holding individual meetings with new members. She has also met with groups of Democrats as part of her outreach efforts, including the Congressional Progressive Caucus, the New Democrat Coalition, and members of the bipartisan Problem Solvers Caucus.